The Greater Charlotte Cultural Trust, formed in 2002 as a partnership between the Arts & Science Council and Foundation For The Carolinas, provides endowment fund management services for the Mecklenburg County cultural sector. GCCT is dedicated to growing and sustaining a vibrant cultural community in Charlotte-Mecklenburg by providing endowment management and oversight and investment expertise to build and grow permanent funds for the area’s arts, science and history organizations. Board of Directors - The Greater Charlotte Cultural Trust’s board of directors is comprised of individuals who care about the life of the cultural community and have expertise in endowment management, investment, finance and legal-related areas. The board has direct oversight of two investment pools which are unique to GCCT and are managed by Wells Fargo and Bank of America. The board is responsible for monitoring performance, with the goal of achieving a return commensurate with the risk of the particular investment strategy. Investment Consultant – GCCT utilizes the services of the FFTC Investment Consultant (currently Mercer), which specializes in institutional funds and assists with consolidated reporting and oversight of all funds within GCCT. FFTC Investment Staff – In addition to the Investment Consultant, FFTC’s internal staff includes investment professionals who further assist the board in monitoring all aspects of FFTC’s investment portfolios. The Greater Charlotte Cultural Trust’s board of directors believes the most important investment decision is the asset allocation decision. Our approach to asset allocation is based on developing the appropriate mix of investments that address a portfolio's long-term growth while maintaining an acceptable level of risk and protection against inflation. The Greater Charlotte Cultural Trust establishes its spendable income rate to balance near-term spending requirements with the long-term preservation of capital in endowed or quasi-endowed funds. In compliance with North Carolina law – and leveraging the financial expertise of the GCCT Board and Investment Consultant, Mercer – GCCT carefully considers several factors, including current and forecasted economic and market conditions, to determine its annual spendable income rate. For 2019-2020 fiscal year, the spendable income rate is 4.5%. Your spendable amount is calculated by multiplying this rate by the average daily balance of your fund over the previous three calendar years or since fund inception (for funds less than three years old). Please note: As described in its fund agreement, a fund may have an alternative distribution plan or a different spendable income rate than listed above. The GCCT Board reviews the spendable income rate annually. When GCCT was established, the funds were originally invested with two major banks: First Union (now Wells Fargo) and Bank of America. 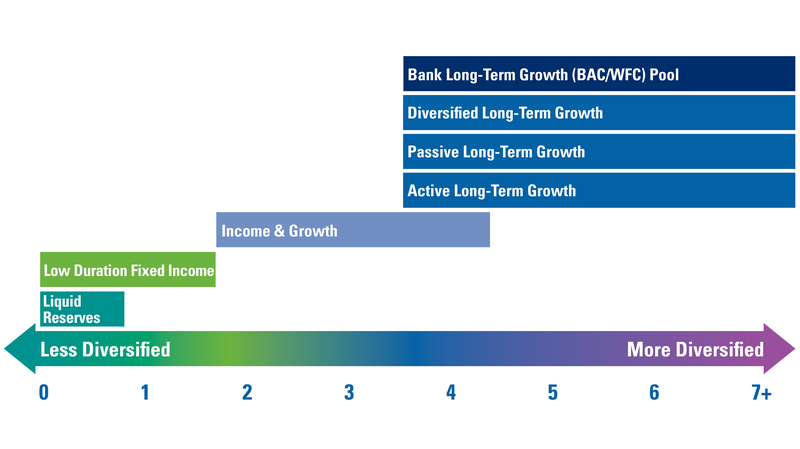 To honor the legacy of the banks’ support of our cultural community, GCCT fundholders have an additional pooled option — the Bank Long-Term Growth (BAC/WFC) Pool — in addition to the investment pools offered by Foundation For The Carolinas. Follows a broadly diversified investment strategy, with a predominately global equity and modest fixed income orientation, tactically layered by real assets and hedge funds. Seeks capital appreciation with a long-term investment horizon. The pool is managed 50% by Bank of America and 50% by Wells Fargo.